My interest in psychology began over 40 years ago when, as a young, naive 18-year-old I elected to take a psychology module as part of my education degree. I had no idea that it would come to play such a significant role in my professional life. For 30 years, teaching creative and performing arts, I experienced the joy of helping children and young people find their creative spirit, excel in an area outside the formal and academic, and express their feelings and thoughts through their bodies. And crucially, for me and for them, it’s about creating relationships that enabled my pupils to access their inner worlds and, when needed, feel safe enough to share those worlds. When I began teaching it was not considered important for teachers to know any more than Piaget, Vygotsky, Skinner and some child development. This may have changed, but even today I wonder at the decision to omit attachment theory, at the very least, from initial teacher training. Over the years, moving from Head of Year to Designated Safeguarding Lead to Pastoral Head of School and Deputy Headteacher, I found it increasingly necessary to find out for myself what could possibly be driving the behaviours of some of the children I met. I wanted to know how their experiences moulded and shaped what they were presenting at school. What were the best ways to support them? What were the options? I’m sure other professionals who work with children will know the phrase ‘When I met their parents, I understood’. But I needed to know more than this. What was actually happening to these children and why? The children who struggled to sit still, who refused to come to school, who had no friends. Children with ‘escape’ plans – and this was in the days before schools were surrounded by security fences and locked doors, so just walking out of the door was pretty easy. Children who, no matter how ‘nice’ you were, seemed to hate the very essence of the adults around them. Children who would push and test you to the very limit. Children for whom school was not a safe place for them to be. And once I’d found out, what was I going to do with that knowledge? Although open expression of this may no longer be acceptable, the feeling has not completely gone away. But how and why do we expect children to be able to learn if we ignore the world that they have to carry with them? How can their brain learn anything new if they are unable to process what is happening in their lives? Why would they concentrate in a lesson if they are fearing for mum’s life? When I talk to staff in schools I try to move them from knowing this intellectually – which most of them do – to ‘getting this emotionally’. To having this understanding as part of the fabric of who they are. Because, as John Hattie has said, who they are, in the classroom, is so much more important than what they know. Ten years ago a new opportunity opened up for me. I left teaching and became an adviser with Services for Education – initially with a safeguarding brief but then with lead responsibility for emotional health and wellbeing. Now I had the chance to share what I believed was important. I was, and still am, able to go into schools and work with staff on a wide range of subjects, hopefully influencing their practice and the way they support children. Attachment and how insecure attachment might look in the classroom; what survival, looks and sounds like, and how it might feel; creating an emotionally safe classroom and school. 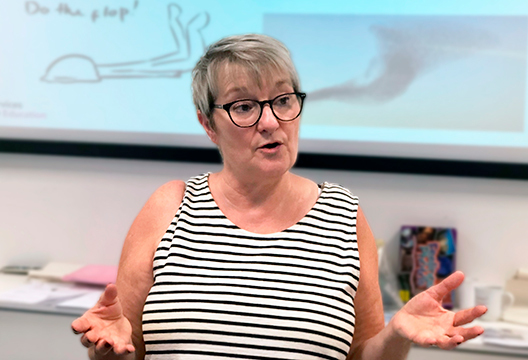 These are some of the sessions I have created to meet the needs of schools managing vulnerable children – those who don’t meet the threshold for cash-strapped support services and wider psychological support. Schools where dedicated adults do what they can whilst still attempting to reach the targets set by past and present governments who have little or no regard for the enormous challenges some children are living with. A significant part of my work is also supporting the health and wellbeing of staff who are, after all, responsible for setting the climate in the classroom day after day. The well-known analogy of getting your own oxygen mask in place before helping anyone else illustrates the importance of staff wellbeing perfectly. Add to that the requests from schools to speak to parents and I think I am covering a few critical bases! About nine years ago I became a protective behaviours trainer, which completely opened up my understanding of what it means to feel safe and how having an internal measure of safety can help children (and adults) so much more than relying on the external references given to them by others. That led to me developing, first of all, an approach to anti-bullying work based on ‘the right to feel safe’. It then led me to writing books and creating resources packs for children and adults, which have become my proudest achievement. Something Has Happened was created to help adults introduce the themes and strategies of protective behaviours. With a safeguarding ethos the book and pack help children to recognise the ‘early-warning signs’ in their bodies and to understand when these feelings move from being exciting to indicating ‘I don’t feel safe’. The activities also help children to create a network of trusted adults, learn about the importance of persistence, and how breaking the rules in an emergency is OK.
Ruby Rafa and Riz: Feel Think and Do goes deeper to explore how we can all feel differently about the same thing, how feeling and thinking differently is OK, and the ‘big’ lesson, the connection between our feelings, thoughts and behaviour, that feelings and thoughts are hidden but our behaviour is on show and no one will know our feelings and thoughts unless we tell them… and that is sometimes what we have to do. I have recently completed a research project into the usability, suitability, enjoyment and success of using this resource with primary-age children. Over 300 children in eight Birmingham primary schools had the resource delivered over a period of six weeks. The data from the children showed increased levels of understanding around the connection between their feelings, thoughts and behaviour, and powerful and heartfelt qualitative data from the staff. All recommended the resource and enjoyed using it. Myg and Me is my latest resource. It has a bit about the brain, introduces children to the amygdala, assures them that feeling anxious is normal and healthy and then takes them through a host of self-calming and self-regulation strategies that they can use to become a ‘child in charge’. I consider myself very lucky to be able to do this job. To share my thoughts, ideas and experience to help to improve the lives of children and hopefully the adults who work with them, is a privilege and one I take very seriously. So what about my love of psychology? It has continued throughout my life, with the conferences I attend and the papers/articles I read figuring in my work. Attending an acceptance and commitment therapy conference last year introduced me to ideas and processes that I have been able to incorporate into my work with staff in schools. I now include elements of hooks and triggers, noticing and challenging thinking into staff wellbeing sessions; and values and compassionate leadership when working with new head teachers. The work of David Shemmings and disorganised attachment, Bessel Van Der Kolk and trauma, Vincent Fellitti and adverse childhood experiences, and Shoshanah Lyons at Beacon House, provides theories, approaches and thinking that are crucial to supporting not only the most vulnerable of children but also to ways of improving the classroom experience for all children. I’d like to see attachment theory become a statutory, non-negotiable element of teacher training – at the very least for the designated teacher for looked-after and previously looked-after children. Thankfully, there does seem to be a growing acknowledgement that children and young people learn more effectively when they feel good about themselves. With the announcement on 19 July of a government commitment to mandatory health education in all schools we are at the beginning of something potentially life-changing. As chair of the wellbeing group at work, I write a monthly newsletter and always include elements of psychology, neuroscience, neuropsychology – articles have included sleep, thinking about thinking, mindfulness, cognitive bias, the challenge of the disengaged mind, and Brain Awareness Week. And I have recently been offered a position as a schools engagement trainer with the Anna Freud National Centre for Children and Families and look forward to contributing to their programmes. And finally, my ongoing inspiration is my daughter Sophie, completing her PsychD in Clinical Psychology and qualifying as a clinical psychologist. Indeed, it was Sophie who suggested that professionals other than school staff would be interested in my resources, and encouraged me to submit a poster on my research project for an upcoming BPS conference in October. She keeps me on my toes and up to date; we have a mutual ‘Have you read this article?… I think you’ll find this interesting… Have you heard about this conference?…’ I like to think that my giving her Oliver Sacks’s The Man Who Mistook His Wife for a Hat to read all those years ago may have something to do with it! Can we be scientific about science education?